I've been playing with SmarterChild for a couple of weeks now, and it's really an interesting hybrid interface of a type we'll see a lot more of in the future. For those of you not in the know, SmarterChild is a bot that you add to your IM buddy list that you can ask questions or do tasks by simply opening up a chat window with it. This is, well, smart on a number of levels. For one thing, you don't have to install another program; it's part of something you already know and use. Thus, installation is pretty minimal, as is de-installation and learning how to use it. Getting started is as simple as typing "Hi" into a chat window. And most of the commands for it are pretty straightforward sentences or words. "Movies" brings up a list of movies playing in my area. And it knows my area because I've asked for "movies 15217" (my zip code) in the past, so it remembers that and just assumes I want that zip code. The "menu" is pretty flat. It's like an automated phone system, but with the benefit that you can see your choices instead of only hear them. It also fixes some of the holes in IM: you can leave IM messages for offline buddies (or yourself!). You can have SmarterChild remind you of appointments too. SmarterChild also has a veneer of a personality: not enough to be obnoxious (a la Clippy) but a bit more than a command line. You can "chat" with it if you so desire, or you can just get your raw information quickly. The personality doesn't stand in the way of your tasks. The really brilliant thing about SmarterChild really is its use of IM as its context. Lately, I've found myself using SmarterChild more than Google or Yahoo for certain tasks (weather, definitions, translations, movies) and the reason is simple: the one item on my desktop that is nearly always on and visible is my IM buddy list and there, "sitting" in the buddy list, is SmarterChild. I don't have to launch or find my browser to use it; it's nearly "always on" because my buddy list is always on. It's much easier to double-click on SmarterChild and type "forecast" than it is to open a browser window/tab, bring up Yahoo, go to weather, type in my zip code, and then scroll past ads to find the forecast. SmarterChild is almost like a personalized RSS feed in its use and simplicity. The speed that you can type questions and get a response reminds me that there are times when a command-line mixed with natural language can be useful. SmarterChild certainly isn't the first of these sorts of bots, but it is really the most useful of them I've encountered. And you can get a sense of what these sorts of smart agents could be like in the future, if say, a SmarterChild was woven into an operating system. I'm looking forward to it, and will hopefully get to design one. After 10 years of thinking about it, I got myself a tattoo for my 35th birthday. 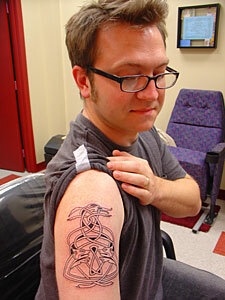 The artwork and inking were done by Tim Azinger. I wanted a symbolic reflection of my family, so you have two celtic dogs (for my wife and me, both born in the Year of the Dog) and a celtic dragon (for our daughter, born in the Year of the Dragon) growing out of them, all intertwined by complicated knotwork. It's become almost a design cliché to talk about making things that are useful, usable, and desirable. Indeed, if I hear those three words together in a phrase once more, I might scream. There has to be other adjectives, perhaps sub-adjectives of usef--ah, I almost did it!--that can describe the types of designs that we strive to make. And maybe even describe the type of designer we want to be. A successful design not only shows the bright wit of its creator but is smart itself, instantly nimble and dexterous in its functionality. That is, not only is the product clever, but so is its creator. I really like the word clever. It implies intelligence without smugness or condescension. It suggests humor and slyness without being obnoxious. And it also implies another of my favorite design words: delight. Using something clever, especially the first time, leads to moments of delight when you discover how clever, how thoughtful, it is. And delight is one of the most sublime emotions that one can experience, leading to long-lasting good feelings about something. Thus, I think we should add cleverness to the pantheon of concepts to strive for and design for. It would be clever to do so. Although I'm not quite sure my wife would appreciate my driving around in limousines with blue-blooded girls of independent means. I don't know anyone who fits that description anyway, I suppose. It's my birthday again today and yes I am 35. I'm not as despondent as I was last year, but neither am I as upbeat as I was two years ago. But hey, at least it's not snowing like usual (but probably will be tomorrow), and my 35th year looks like it will be an interesting one, filled with lots of changes and friends both old and new. So, happy birthday to me.